Welcome to Sharks Pool Tables! At Sharks pool tables we believe buying a pool table is an investment you will be enjoying for many years. Pool is a universal game that can be enjoyed by the entire family. It's a great activity for kids as well as for adults. 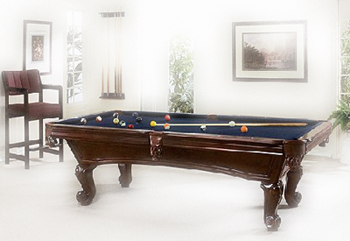 A pool table should also be a piece of furniture it is usually the focal point of any game room that it occupies. At Sharks Pool Tables we strive to give you one of the best selections of high quality pool tables at unbeatable prices. Our goal is to get you the highest quality pool tables, the lowest possible prices, the most careful shippers, and very skilled pool table installer and pool table movers mover to make your game room shopping a most pleasant experience. We keep most of our pool tables in stock in san jose so most likely we can deliver and set up your billiards table anywere in the San francisco bay area or California within a 2 to 3 day period. We are the only Authorized Dealer for Brunswick Billiards Brunswick Pool Tables and Golden West Billiards Golden West Pool Tables in the Bay Area!!! Enjoy browsing and if you have any questions regarding our pool tables feel free to call or email us. We also have a nice selection of game room equipment and billiard accessories sales. Including poker tables, pub tables, chairs, shuffleboard tables, foosball tables, cues, billiard balls, arcade games and pool playing accessory kits. We guarantee you won't come across a finer pool table for the price. all pool tables come with any color felt (top) of your choice 36 colors to choose from at no extra charge. we are the only Authorized dealer for Brunswick, presidential, and golden west pool tables in the bay area!!! !